Drizella will beg for your chocolate cake with her knees practically on the floor droning on and on about how she never gets any sugar, while Anastasia is whining nasally in the most irritating fashion about how her life could not get any worse or more miserable, while simultaneously sticking out her tongue and blowing raspberries at Drizella every chance she gets. Yet, Lady Tremaine has the nerve to insult my parenting skills during dinner and question if my children know how to behave themselves. I mean really, that is the definition of sanctimonious if I ever heard one. 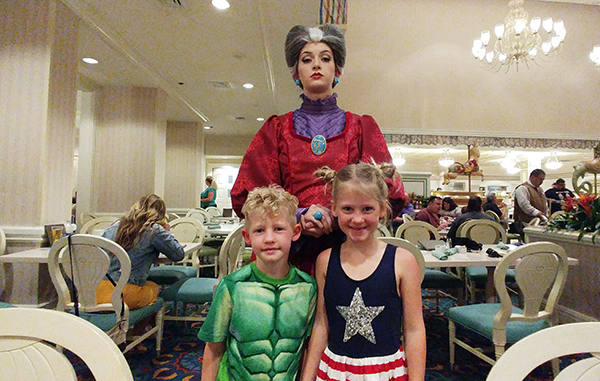 Not that I should be surprised considering the source, but the audacity of Lady Tremaine as our hostess at 1900 Park Fare was borderline crude. The restaurant is so unbelievably loud, we couldn’t even hear ourselves chew our food, and the noises, the banging and the shouting from corner to corner wasn’t coming from the tired kids running all over the parks. Nope, it was coming from those bratty girls. And the eye rolling? Good heavens! My children even thanked her for being bothered enough to stop by our table. It was their birthday and she had the poor taste to treat our family in such high disregard. I can’t believe I sat through it. And not only did I sit through it, but I laughed and enjoyed the entire thing. 1900 Park Fare is an experience like no other. 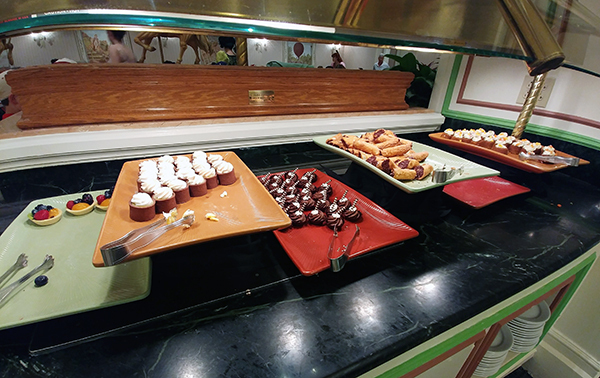 It doesn’t offer the best food at Walt Disney World; if you want a stellar buffet shimmy on over to Cape May. The restaurant itself isn’t anything special. Housed at the Grand Floridian it has a beautiful setting, but the decorations, the lighting, and the seating are all fairly standard. 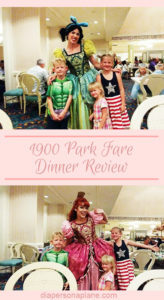 What 1900 Park Fare does offer is one of the most fun, if not the most fun, dining experiences at Walt Disney World. 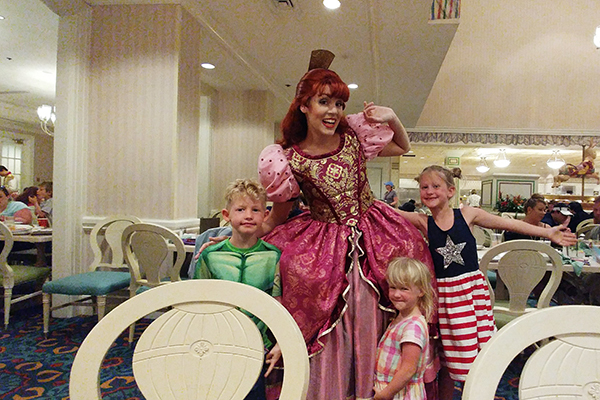 During the character dinner at 1900 Park Fare you’ll be greeted by five famous personalities: Cinderella and her evil stepsisters, their presumptuous mother Lady Tremaine, and of course Prince Charming. As they weave their way through the tables to meet and greet, they’ll interact with each other as well. The sibling rivalry between Drizella and Anastasia is unparalleled. This is by far the most entertaining part of the evening. 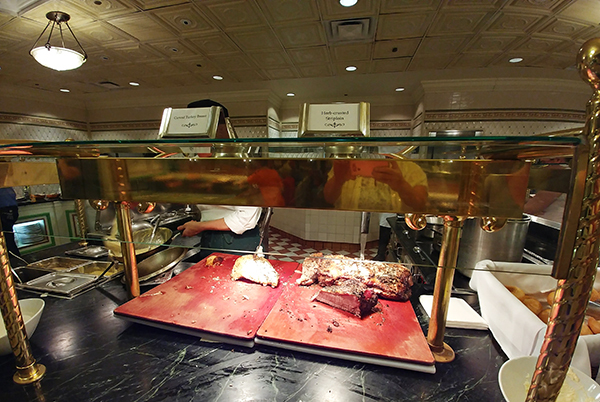 It’s hard to even get up and visit the buffet for fear you’ll miss out on any of the drama. 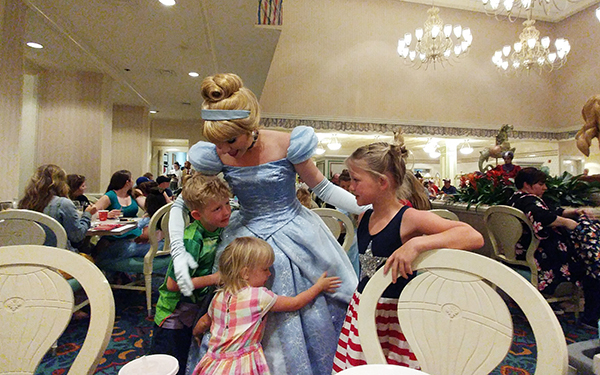 Unlike other character meals, you’ll get a chance to interact with the characters on more than one occasion. 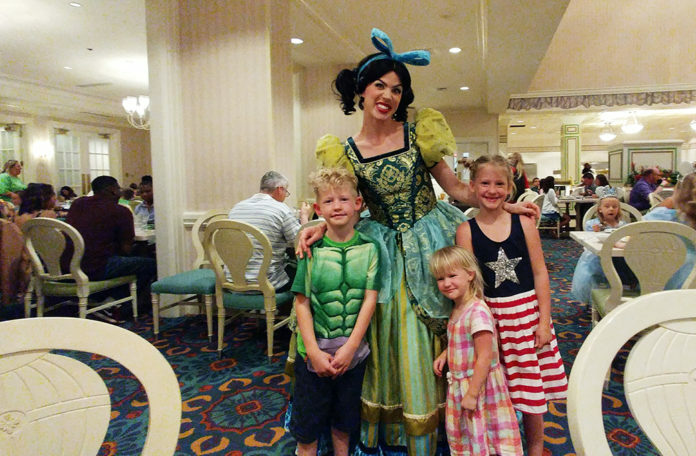 Drizella stopped by our table so many times I lost count. Our son was so enamored with her. As mentioned, we came here to celebrate the twins 7th birthday. They were not shy about spreading the word it was their special day, and Drizella was not shy about voicing her jealousy. 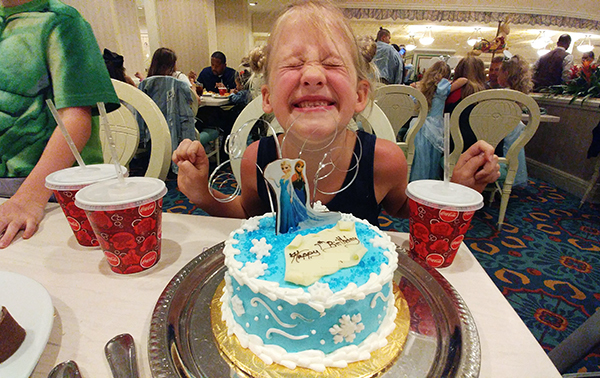 We ordered a specialized cake for each of the twins directly through Walt Disney World as a surprise. When they came from the kitchen, both Drizella and Anastasia came over to drool, and of course complain that the cakes weren’t for them. 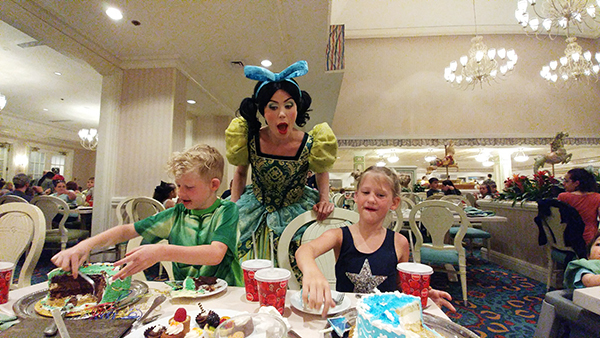 Drizella threatened to throw a temper tantrum if she didn’t get a piece! My son was especially eager to oblige her. Pie ran to get her a plate from the buffet and then hid laughing uncontrollably when Lady Tremaine found out. The food at 1900 Park Fare is second to the entertainment, but you’ll find a wide array of options including salads, vegetables, meat and dessert. There is a separate station for the kids. Don’t pass on the restaurant’s signature Floridian Strawberry Soup! 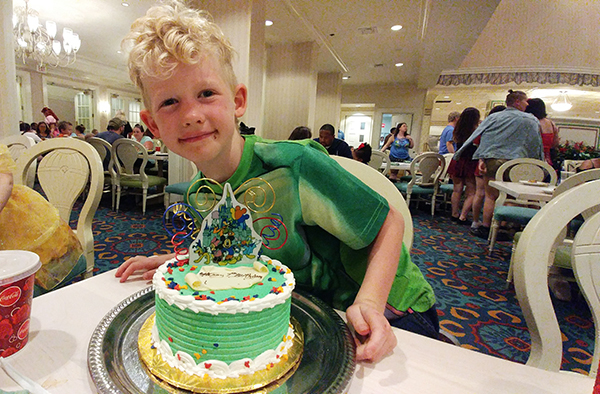 ► For Kids: 1900 Park Fare is our family choice for the ultimate dining experience at Walt Disney World. Kids will find something they love to eat while being entertained at every turn. There is no need for them to sit quietly, or even sit at all. Their imagination and creativity will be buzzing with ways to get the sisters to tease each other, and then watch in anticipation to see what the awful Lady Tremaine will do to scold them. Have you been screamed at and berated at 1900 Park Fare? Were you as offended as we were? We’ve dined at 1900 Park Fare on two separate occasions, years apart, and both times were absurdly fun. If you want to look the part, Etsy has some adorable Anastasia and Drizella costumes! 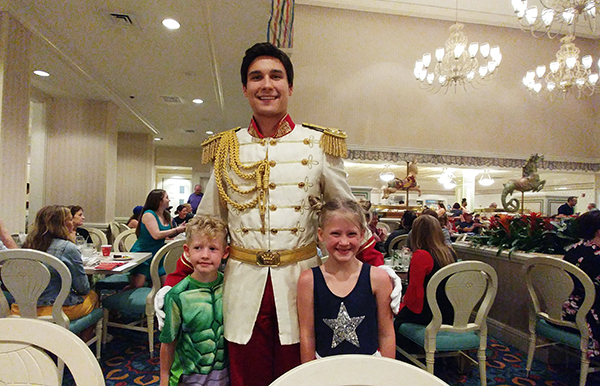 Of course, Cinderella or Prince Charming is always a great option as well! I think we might actually test out dressing up as any other princess just to see how the sisters would react! 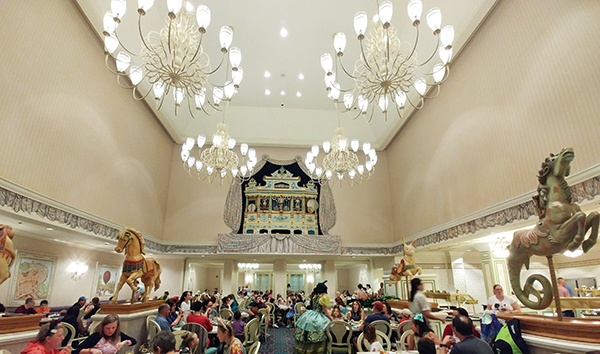 ► Nap-Time Version: Dine in the regal setting of the Grand Floridian while being humiliated, mocked and shouted at during your meal at 1900 Park Fare. We love eating at Walt Disney World restaurants and have a full page, updated constantly, devoted to our restaurant reviews at the Happiest Place on Earth – or check out all the fun activities there is to do at all the parks! I had no idea they did such character performances like this! It’s definitely the best character experience we’ve ever been to!